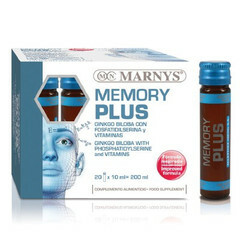 Memory Plus is the all new product to assist with maintaining your memory and keeping your edge as you grow older. 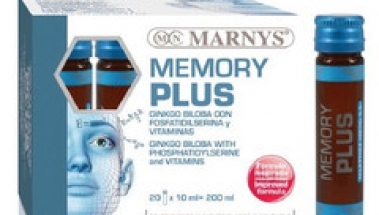 It contains various nutritional ingredients such as Gingko Biloba, Phosphatisylserine, Thiamine, Panthothenic Acid and Vitamin B6 and plenty of others. Thiamine (vitamin B1), Riboflavin (vitamin B2), Vitamin B6 and Niacin (Vitamin B3) contribute to assisting the function of the nervous system. Thiamine (vitamin B1), vitamin B6 and Niacin (Vitamin B3) contribute to normal psychological function. Pantothenic acid (vitamin B5), Riboflavin (vitamin B2) and Vitamin B6 help reduce tiredness and fatigue. Directions: Take 1 vial a day before breakfast. It can be taken diluted in water or juice for periods of 6 to 8 weeks, according to the need.